This week we are sharing a couple of our favorite summer drinks for friends, family, sipping, and sparkling. We took a few classics and gave them a good twist and dressed them up! These two favorites add a kick of pink and green to our cocktail hour. They will definitely make your next get together more fun! One of my all time favorite drinks is a French 75 (it has been forever - even before I moved to Louisiana). When it's a bit warmer than I like and maybe a tad bit humid, there isn't anything more refreshing than the sparkling citrus bubbles of a French 75. I do also love a good sparkling rosé (a close second to the French 75) so we made up a new Blushing 75 for sipping in the summer. The pop of pink gets me every time! This is a very fun drink to make at home with friends and family whether your hiding from the heat or sitting out on your front porch! Everyone will want to know what you're sipping and give it a try too! You can layout all the ingredients, set up your bar cart, and show your bubbly off in a gorgeous champagne bucket. Nothing will look like more fun than your blushing bubbles! Shake well and refrigerate until chilled. When you are ready to serve, add 1 ounce of the mix to a champagne flute and fill the rest with chilled Rose Brut. Garnish with a lemon twist and you'll be blushing 75 too! Another classic to sip on this summer is our Tito 'n Rita. It's a take on a margarita without the tequila. Too much tequila isn't always refreshing and can be a buzzkill on a really hot day. Our Tito 'n Rita are a light green frothy drink garnished with a sprig of mint and a twist of lime. They add a refreshing touch to our summer get togethers. It doesn't hurt that they are also uber preppy to look at when served with the Blushing 75. They sure do dazzle at cocktail hour! Add 2 cups crushed ice and shake again ‘til frothy'. Rim 6 double-old fashioned glasses with sugar (or salt, optional). Fill each glass with crushed ice. Strain the drinks into each glass. Garnish with a lime twist and mint sprig! Now, when we sip and sparkle in the summer we like to lay out some fresh summer bites. This time we sliced fresh peaches and watermelon with prosciutto, mint, sesame seeds, and basil. It not only looks pretty but is super easy and fresh. We used this zebra leaf platter from Beatriz Ball to show off our colorful bites. Beatriz Ball's organic style platters are great all year round. Your food and drinks should look as good as the time you spend making them! I love dressing up my table - it's the best way to set the mood for the evening. Click here. 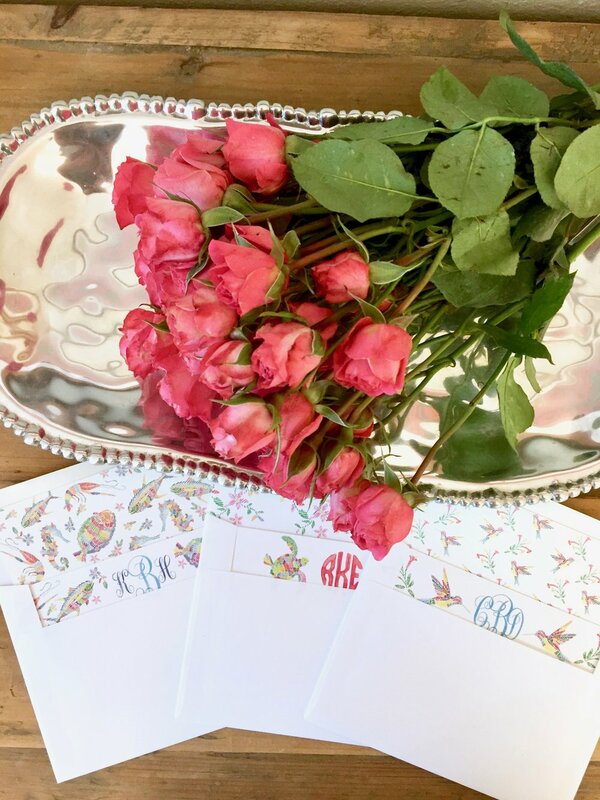 Also, pictured above is our new watercolor stationery we launched in early July. We have several inspired Otomi designs (click here). We used similar designs to create our custom pillows and cocktail napkins. There is so much you can do today with custom watercolor designs! We hope you like our watercolors, tablescapes, recipes, pillows, and designs as much as we do!